Sometimes the best nights are spent in, and it's never more true than when I decide to cook a feast and invite a few girlfriends over. Growing up with an Italian mother you learn a thing or two, and in the last couple of years I think it's safe to say I've come into my own as a cook. 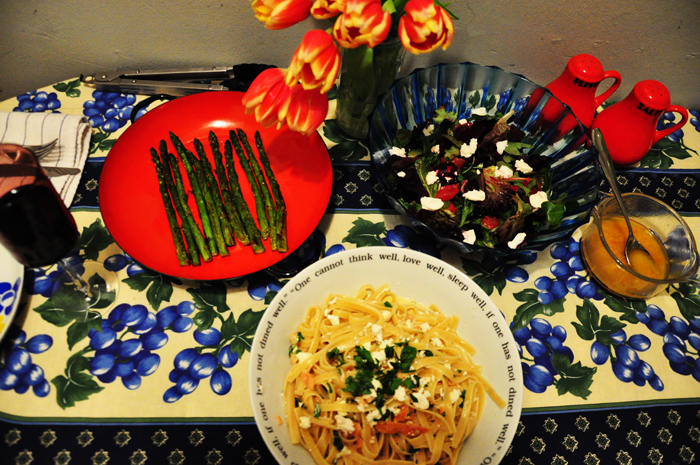 On last night's menu: grapefruit and roasted beet salad with goat cheese in a lemon-mustard dressing, roasted asparagus, and fettuccine with salmon and feta in a light cayenne cream sauce. Extra bonus: don't overdo it on the cheese and use light cream to make your sauce and it's a super healthy meal. Now who wants the recipe? - Bring a large pot of salted water to boil. Add the fettuccine and 1 tbsp of olive oil. Stir frequently and cook until tender but still firm to the bite. 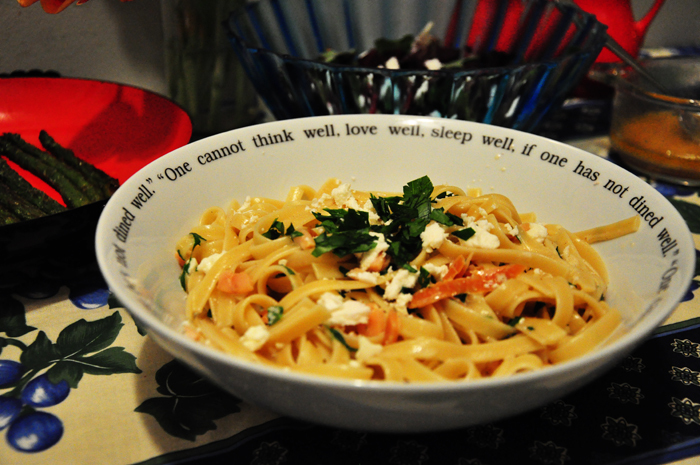 (tip: follow these directions to the T. Fettuccine will stick together if you don't). Drain, return to pot, add remaining olive oil, cover to keep warm. - Pour the cream into a small saucepan and bring to simmer but not boil. Pour the brandy into another small saucepan and bring to simmer. Remove both from heat and mix together. - Cut the smoked salmon into thin strips and add to cream mixture. Season to taste with cayenne and black pepper. Just before serving stir in fresh parsley. - Pour sauce into pot with pasta and toss thoroughly with two large serving forks. Transfer to serving dish and sprinkle with feta cheese. Garnish with parsley leaves. I LOVE the back of that sweater, so adorable! I'm such a homebody...I mean I love going out at nights but I love staying in to. There is nothing like having a few friends over for some yummy food. Love the whole look, def. laid back and relaxed. Esp love the back of the sweater! Also I'm in love with the dishware. The bf and I have to go shopping for some new dishware. The mint colored beanie is so cute, makes me want to go out and get one! Aww the saying on your plates is great, I like the way those plates think...maybe it's the owner :). Looking casual and adorable. the sweater is awesome and I love how you layered it with a collar shirt under! What a cute sweater! It looks so cozy and warm. really like the effect you used for your pictures. Love this sweater! The back is so unexpected! Is it a recent purchase? You look so adorable and that food looks AMAZING! The bowl with the writing is super cute, too. Your blog is amazing, I loved all the photos, they're great inspiration! Thank you so much for your comment in my blog, I follow you with bloglovin' as well! I LOVE YOUR PHOTOS. PERIOD. 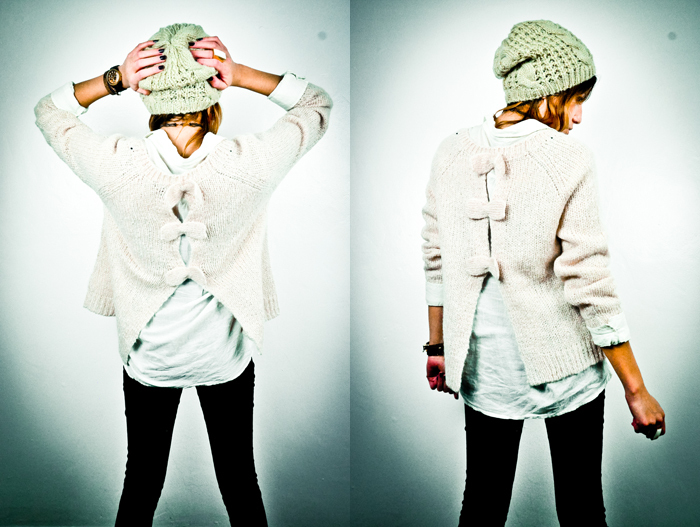 PS- love the bow on the back of that sweater! Definitely following you now. Thanks for commenting on my blog! You made this? Wow it looks ridiculously delicious. So fresh and clean. Love that kind of taste! And your outfit is so cute. The mint green is such a gorgeous colour! Such a great post, I like it!!! Everything seems delicious! great pics! food sounds fab! love your cute blog!! i absolutely love the hat. feel free to check out my blog too! WOW, these pics are awsome...... you look amazing!!! Who took them? i need a bff photographer too!! Love the comfy look and that wonderful spread. I want one copy of that recipe please. Updated with recipe! Let me know how you like it! Love that necklace and the food looks delicious. I would love to know the recipe.